Shane has been eliminated. Alan has abandoned so we are left with only three riders. This dampens the enthusiasm a little. Today’s stage consists of 4 category 3 climbs and finishes with a category 1 climb up Seskin hill just outside Carrik-on-Suir. Simon had a great day today. He got himself into a break. This takes some courage. First of all you have got to manoeuvre yourself to the front of the bunch, then sprint off the front of a fast moving peloton, settle down onto a ridiculous pace, probably 27/28mph average, then keep up the effort as long as your legs allow, or until the bunch eats you back up again. Simon didn’t manage to stay away for the whole day, he was eventually reeled back in but what an effort, we tip our hats to you Simon. Myself and Damian stayed in the bunch. All seemed to be set up for a bunch finish and a race up Seskin until twenty miles to go when the pace was cranked up on the category 3. Wheels were being lost all over the place. Curses abound. This split the bunch in two. Neither myself nor Damian were in the front part of the split and so we faced a time losing but easier ride home. Chase packs rarely stay riding fast. They slow up to save energy for the next day. Our group of thirty or so lost 11 minutes over the last twenty miles! Seskin proved to be a leg breaker. The mountain was lined with people. My chain came off at the bottom, some kind spectator ran over to me and started pushing me up the hill to regain momentum once I’d fixed my chain, how nice are some people!? The race ended at the summit. An anticlimax after being dropped from the bunch but the three of us were finished and safe to ride another day. Second last stage and we can see the light at the end of the tunnel. This is a whopper tough day. 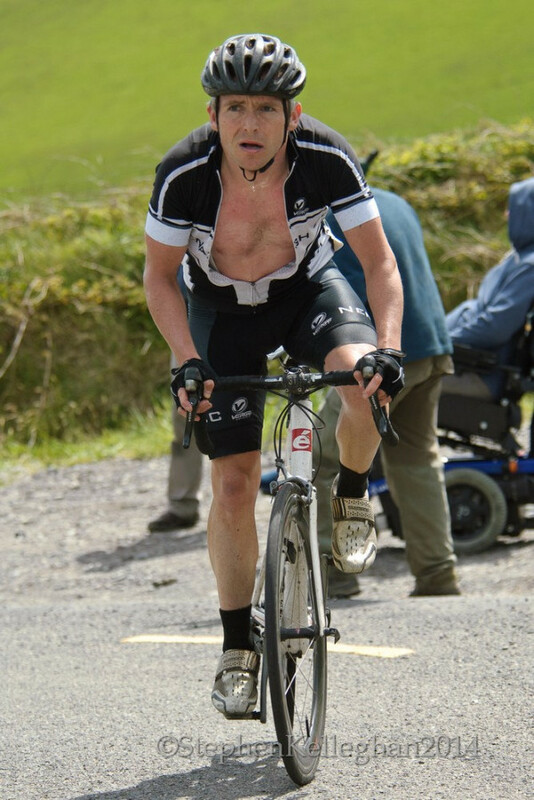 7 climbs including a dreaded back to back category 1 effort over Corabutt Gap followed by Mount Leinster. An early category 3 climb after 10km split the peleton. 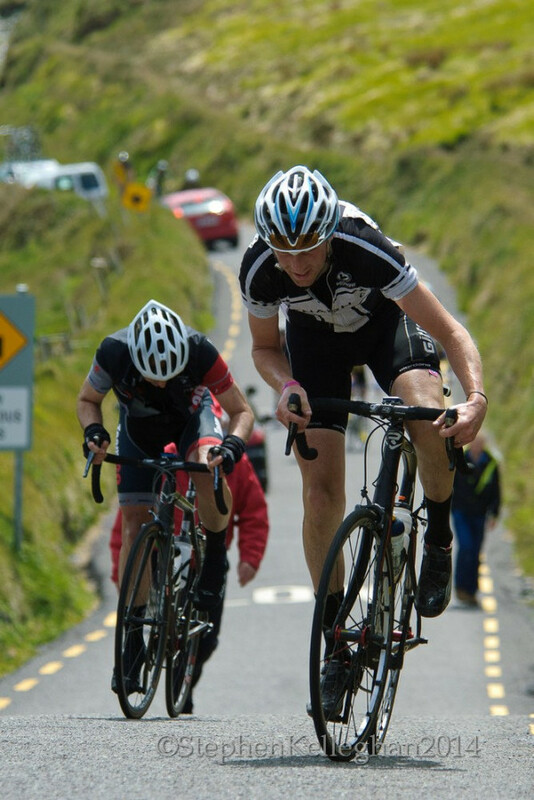 For the first time in a few climbs I got over in the lead pack. This came to nothing however as the bunch stalled and everyone got back into the bunch, sighs of relief for all the riders who were turfed out the back as cycling the 137.7km that remained in a small bunch would have proved difficult and the time limit might have been breached. It was “easy riding” over to the main climbs of the day. My gears broke on my bike and I had to swop onto a spare bike. 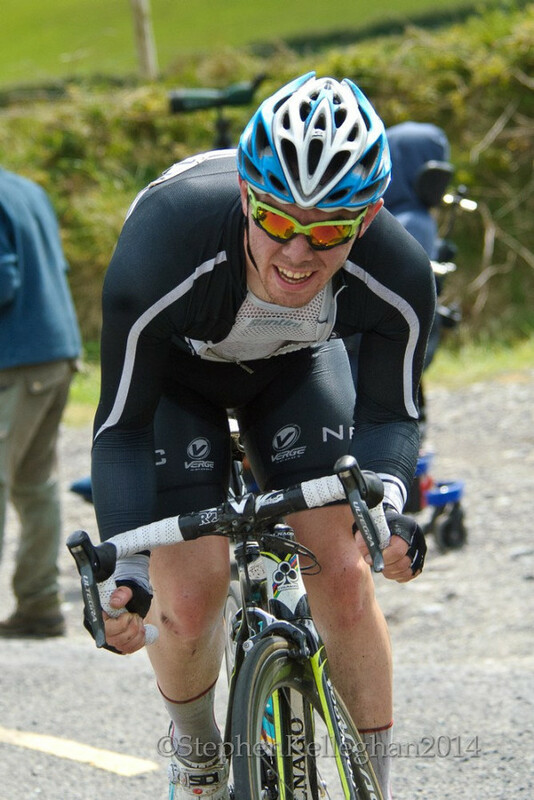 This involves calling up the team car, changing bikes quickly and chasing back into the bunch. It went seamlessly, thankfully, well done Peter and Kenneth, no panicking, very smooth bike change! The category 1’s have to be seen to be believed. They are like walls. The local climb, The Step, would be the only category 1 climb about these parts. After the gruelling half hour of climbing the bunch was in pieces. I climbed well but missed the lead pack and was consigned to chase pack one. This pack swelled to about fifty riders, Simon had done well and managed to get into this group. By his own admission, Simon hates climbing. Damian was in a later chase pack but in no danger of missing the time limit. Things are uneventful in chase packs. You stop riding and accept the time loss. They can be boring if they are formed early in the race. So we all finished safe and sound ready to complete the final stage and turn the brains off. The final furlong. The pace was scorching for the first hour. 29 miles cycled. A break away established itself after an hour. The pace settled. Simon bravely attempted to bridge the gap over to the break. His intentions were for an accomplice rider to break with him but he was left to break solo. He was in the dreaded no mans land ( by yourself, out in the wind, in between groups) for about 10km until the group absorbed him again. The pace cranked up going onto the Skerries circuit. The streets were lined with people. This encouraged faster speeds. I managed to stubbornly hang into the main group on the fast circuits and gladly finished with the bunch. Simons earlier efforts caught up with him but still finished high up in one of the chase packs and Damian closely followed him. Three tired, emotional, stubborn, delighted Ras finishers. 8 done and dusted, 0 to go. Happiness. Relief. Pride. Finally, men of the Rás. Final Thanks: Myself, Shane and the rest of the lads on the Nenagh CC team would like to thank the club for supporting us over the last few days, weeks and months. We couldn’t have done this without your help. I would also like to thank Kevin, Kenneth, Peter and Seán for their patience and help over the 8 days. I know we acted like prima donnas so thanks for putting up with us. Hopefully we can repay ye all someday. Paul Kimmage spotted local superstar Kevin Sherlock and asked for a quick photo.